Florence Meleo-Meyer is an Insight Dialogue Teacher. She teaches courses and retreats in Interpersonal Mindfulness, which is based on Insight Dialogue. Florence has taught meditation for over 30 years. She is certified as a Siddha Yoga meditation teacher as well as a Mindfulness-based Stress Reduction teacher. She has studied in India and the US with meditation masters, S.Muktananda and S.Chidvilasananda. Since 2003 she has studied Insight Dialogue, trained and taught with Gregory Kramer. Florence holds degrees in education and psychotherapy and is a licensed family therapist. 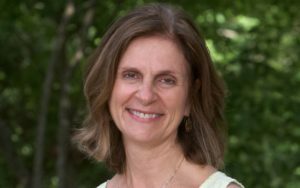 She is a senior teacher at the Center for Mindfulness at the University of Massachusetts Medical School, where she also directs Oasis, An Institute for Mindfulness-Based Professional Education and Innovation. She has trained and taught with Saki Santorelli EdD and Jon Kabat-Zinn,PhD. Florence lives and works in central Massachusetts.